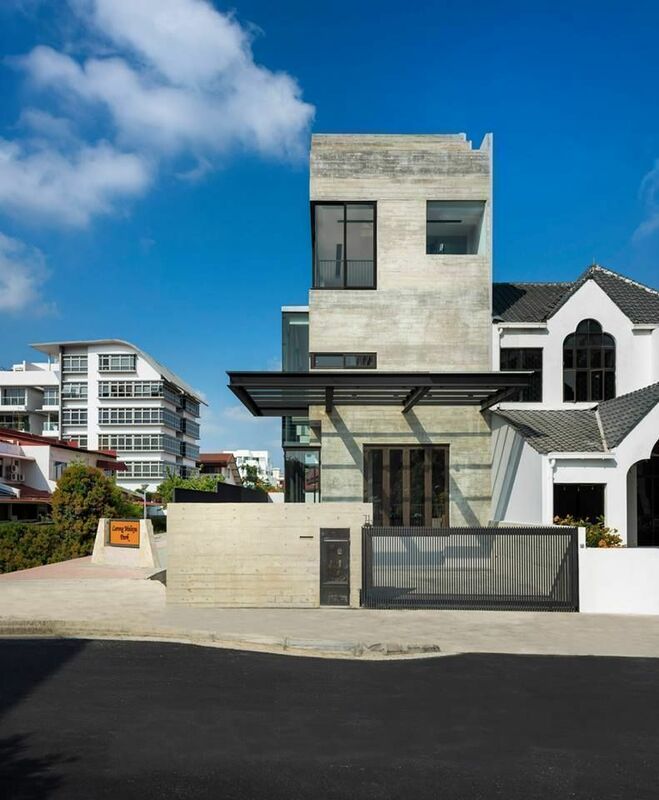 Despite its grand exterior of concrete and glass, this three-storey semi-detached home shines in the thoughtful detailing that adds both character and edge. 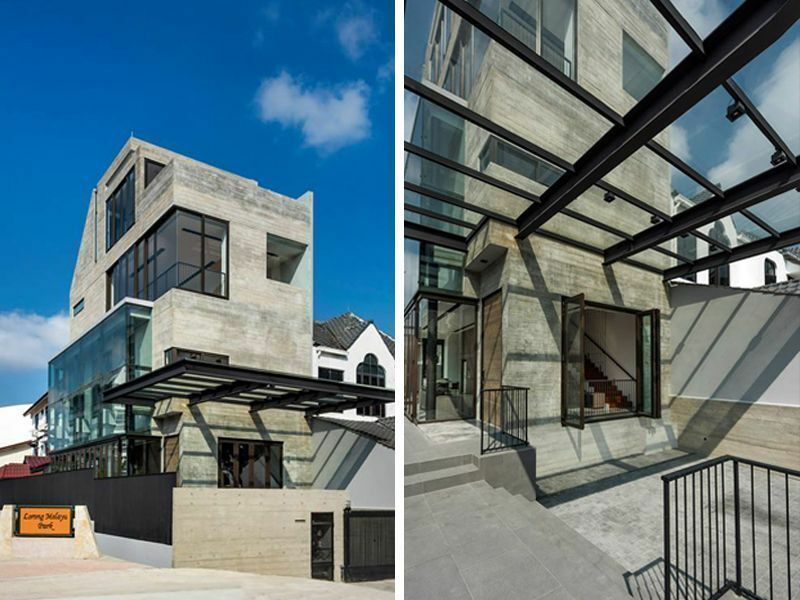 To say that minute detailing takes the spotlight in Mr. Kum’s semi-detached might puzzle at first. The towering three floors of concrete and glass is visible all the way from Kembangan MRT station, a commanding structure reflecting blue and white. Adding to its grandeur are floor-to-ceiling glass door panels stacked in a double-volume concept expanding two floors. Sunlight floods into the interior―this is no concrete jailhouse, but a deliberate combination of raw grittiness and the clean-cut utility of industrial design to add heft to splendour, gravity to height. 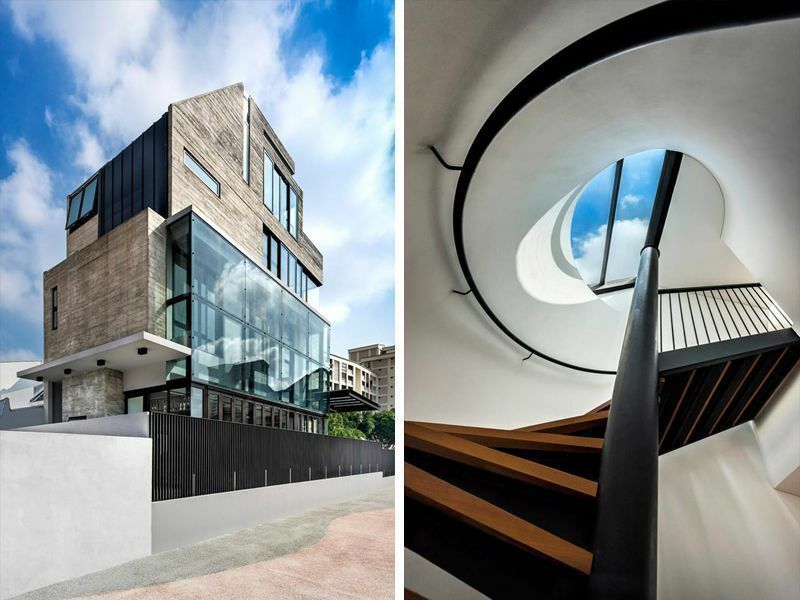 But step closer and other details emerge: steel frames running lines through the panes of cool glass, careful angles with uniform linearity, and concrete surfaces that embrace natural weathering. One realises the attention paid to the littlest things―even the night lights are custom-built to integrate with the fence. Right: the car porch roof was levelled higher to stretch the sense of vertical space. Angled shadows created by its glass-and-steel structure also add soft textures to the structure. Mr. Kum, director of Distinct Identity, worked closely with his team and architects to ensure consistency and cohesiveness ran through both the exterior and the interior. Details and finishings were as important as the overt structure―not only did they have to speak the same design language, these would set the house apart with an understated touch of luxe, design consultant Liyana Ahmad describes. Understated, not emphasised―and in harmony with other elements for a whole that is greater than the sum of its parts. 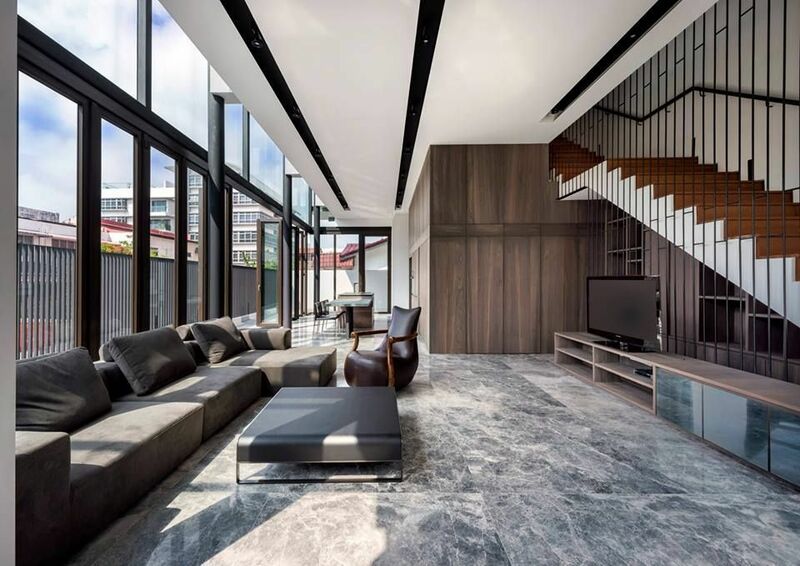 For example, the interior is laid with large longitudinal slabs of grey Emperador marble for the same visual elongation that directs the house. Although keeping to the same monochromatic palette, these slabs add subtle flair via textures. Similarly, velvet was chosen for the sofa instead of leather for its lush softness, which balances out a more stoic monochrome and marble. The ground floor integrates both the living room and dry kitchen into a seamless social space. For practical storage without bulk, cabinets are hidden in the walls that line the area. Having a consistent design language also helps to expand the sense of space, which was a priority for Mr. Kum. To maximise the ground floor, the design integrates both the living room and dry kitchen into a seamless functioning area. This would be to accommodate Mr. Kum’s needs for his family: “It’s a very interactive family, so the whole activity can be within one space—for eating, cooking, and even dining,” Liyana says. 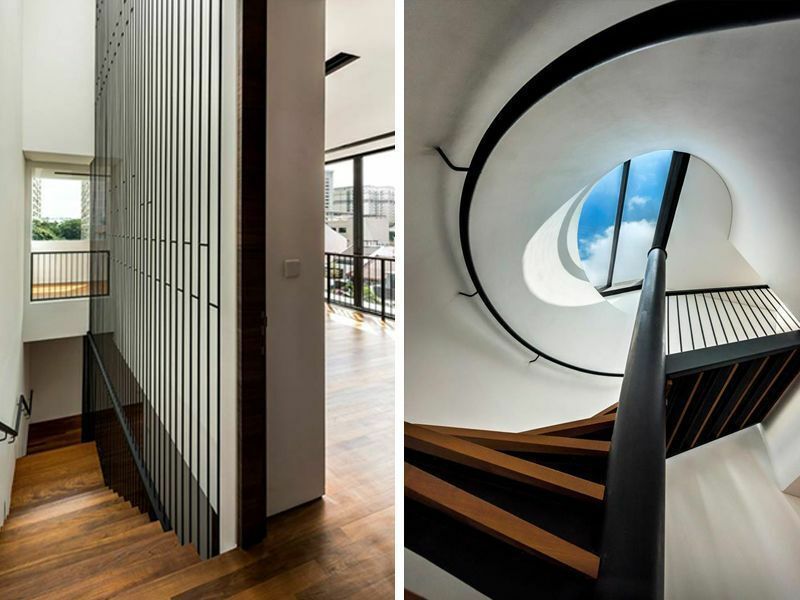 A cantilevered staircase sheltered by steel leads to a warmer wooden palette on the second floor, with the frame stretching beyond to the third floor into an unexpected spiral. The second floor is dedicated to the master bedroom and bathroom, a sweeping space wrapped with full-length windows, not unlike a dance or art studio. To keep things clean-cut, Distinct Identity did away with bulky air-conditioning units for a cooling system that tucks the ducting away. Customised lighting completes the look with sleek lines―again, the same visual language in every detail. 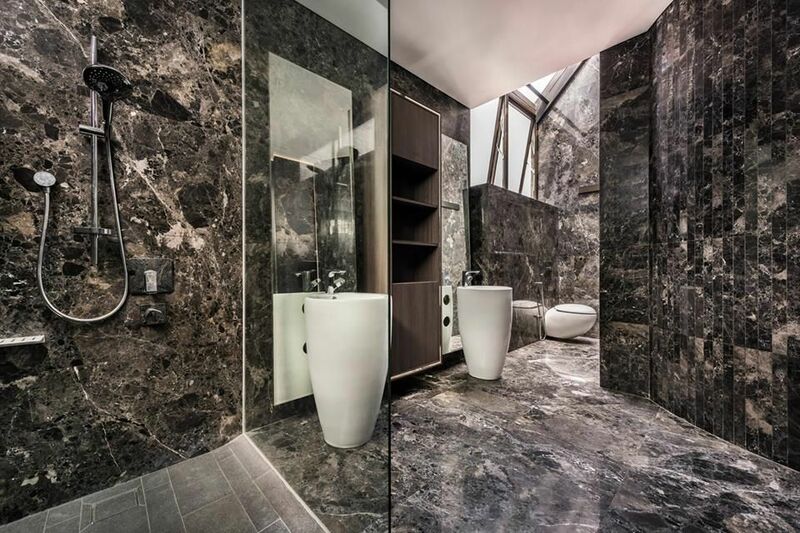 The adjoining master bathroom is washed in a darker palette, with granite textures playing with hard angles created by the full-length mirrors and slanted roof window. With two pedestal sinks flanking a centralised vanity area, the spacious bathroom is reminiscent of a deluxe boutique hotel. This meticulousness also guided the construction process. Building Mr. Kum’s house was a huge undertaking that first stripped the original structure down to its foundations, and working with skilled construction workers was crucial. This would be especially so for the challenge of using materials a notch above the norm: “Using off-form concrete walls is not something common or standard. For something like that, you have to work with a contractor who has experience doing it, and knows how to build it,” Liyana says. And like the house, each detail both in process and result plays a part in contributing to the larger picture. Distinct Identity proves to not be willing to compromise on the quality of both the minute and the grand―a detail certainly worth remembering. We'd love to feature your beautiful home. Drop us a note at hello@cromly.com.